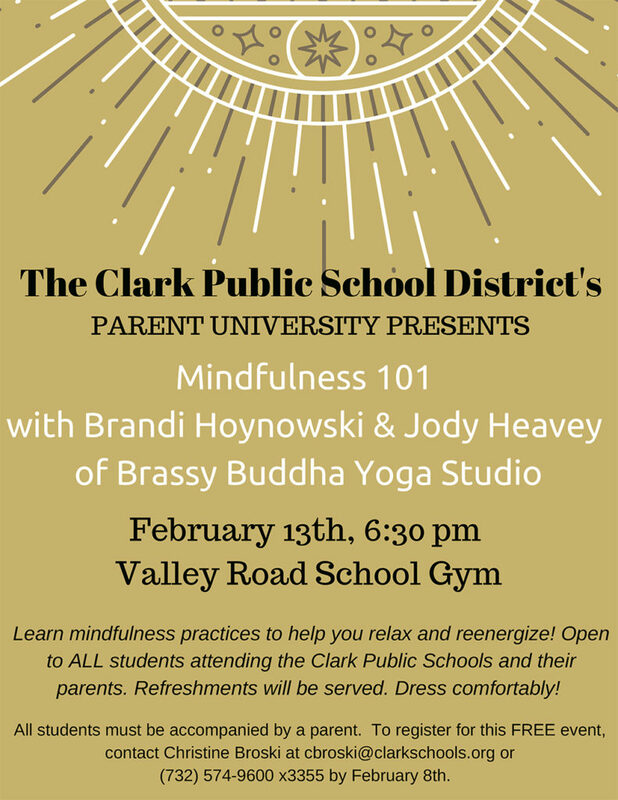 The Clark Public School District’s Parent University will be holding Mindfulness 101 on Wednesday, February 13th at 6:30 p.m. in the Valley Road School Gym. The session, focusing on learning mindfulness techniques to help you and your child relax and reenergize, will be led by Brandi Hoynowski and Jodi Heavey of Brassy Buddha Yoga Studios in Westfield. The free event is open to all parents who have children attending the Clark Public Schools. To register, contact Christine Broski at cbroski@clarkschools.org or (732) 574-9600 x3355 by February 8th. All children must be accompanied by a parent. This event is part of the district’s Parent University program, which includes virtual sessions, superintendent’s teas, and two larger assembly-type programs.